You’ve got your design, now it’s time to create your screen! At Speedball, we want to take the guesswork and frustration out of your creative process and have a suite of products to do just that--no matter what screen printing technique is your preferred method. With Speedball’s Photo Emulsion and Sensitizer, artists can easily create highly-detailed images without the need for a darkroom. Prefer a design created by hand? 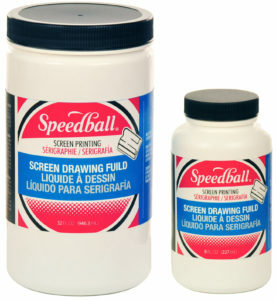 Then Speedball’s Screen Filler & Drawing Fluid are the ideal solution. Not sure which screen printing technique is best-suited for you? Check out Speedball’s Screen Printing Instruction Guide to learn more about which approach is the best fit for your screen printing project. The photo emulsion method of screen printing allows artists to create a photographic stencil featuring highly-detailed images. Speedball’s Diazo Photo Emulsion & Sensitizer offer professional-grade results and remove the need for expensive equipment and darkrooms. 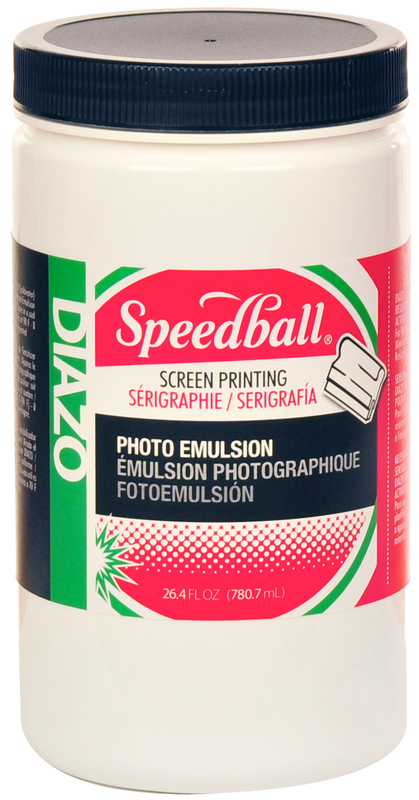 For use with polyester screen fabrics, Speedball’s Diazo Photo Emulsion & Sensitizer may be used with any water-soluble or solvent-based ink and can be easily removed with Speedball’s Photo Emulsion Remover. Available individually or in the top-selling Diazo Photo Emulsion Kit! Don't forget to pair these great products with Speedball's NEW Transparency Pack! These transparencies are essential for use in the photo emulsion process, and are clear, acid-free and designed for use through any ink jet printer. Speedball's Photo Emulsion and Photo Emulsion Remover carry the AP Seal. Speedball's Sensitizer carries the CL Seal. These two high-quality Speedball products work together to create a painted stencil on your screen and are ideal for use on designs that feature detailed hand-drawn images or those possessing a “painterly” quality. Both products carry the AP Seal and Speedball’s Screen Filler is easily removed with Speedball’s Speed Clean to reclaim the screen. Having a tough time knowing where to begin? Speedball's new instructional series on both the Photo Emulsion and Screen Filler/Drawing Fluid Methods of screen printing are great places to start! Select from the links below to watch these helpful step-by-step tutorials, or click to download Speedball's Screen Printing Instruction Guide-or both!